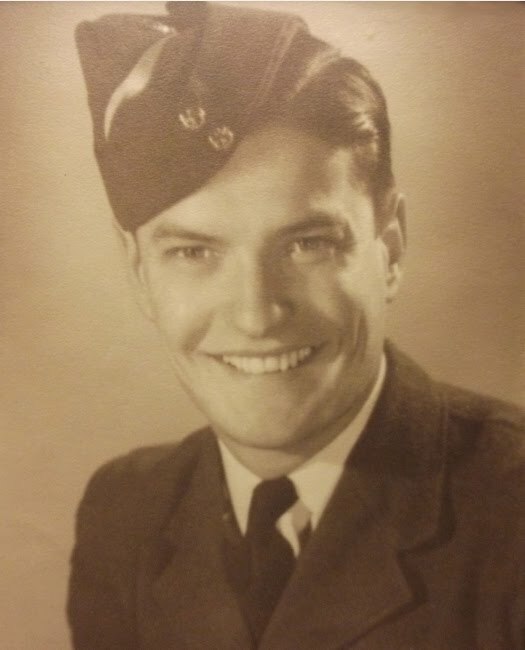 Most of the crew members had been together since their meeting at Operational Training Unit and flying Wellington bombers. 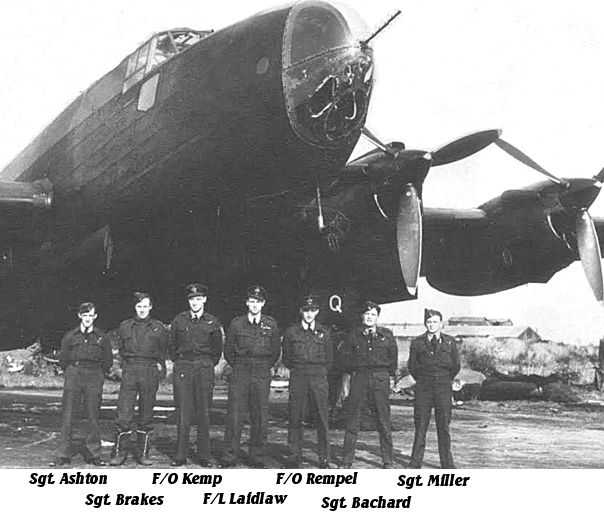 F/O Laidlaw Pilot, F/O Rempel Navigator, P/O Kemp Bomb Aimer, Sgt. Miller Air Gunner, Sgt. Brakes(RAF) WAG Sgt. 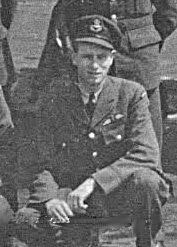 Bachand Air Gunner were the full crew that arrived at 419 Squadron fron No.1659 HCU. Together they develped a tight crew through HCU training and would have their mettle as a crew tested during their tenth sortie, a raid on Muenchen-Gladbach. Where an attack by a night fighter ripped up the bomb doors with heavy cannon fire taking with it the bomb camera, hydraulics and then the shells raked forward to rip up the radio, the "GEE" guidance set and the important IFF unit. Batteries located in the cabin started a fire in a section of the fuselage. The F/E Sgt. Ashton managed to put out that fire, but still had a fire going in the bomb-bay area. Working without the use of an oxygen mask at an altitude were where one was necessary and working within the needed oxygen mask managed to hold a fire extinguisher into the bomb bay area through an access panel. Although he did managed he to get the fire out he was seriously hampered by the flames jumping into the fuselage when the access panel was opened. No mention is made of how or if he was injured by the flames leaping out of the panel as it was first opened. For his actions he was awarded the DFM. November 18/19 where a new wireless operator joined them, Sgt. 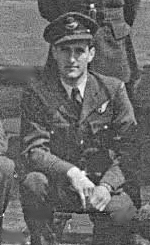 Lagdon was now the crew's permanent wireless operator. The loss of the crew was a mysterious one. Five other crews in the area saw no enemy aircraft or other enemy action such as flak. No mayday was received back from Halifax HR910 and no explosions were seen by the other aircraft. No Luftwaffe records show any claims for aircraft during that time and place. And so this experienced crew and their aircraft disappeared somewhere after there leaving their base. Leaving no trace or record of what happened. Sgt. Brakes their original wireless operator survived the war. was found in Public Record Office Air 2/5002 and reproduced by Ian Tavender in his book The Distinguished Flying Medal Register of the Second World War (London, Savannah Press, 2000) which is an important work on this award at this period. 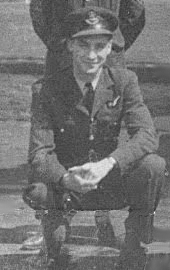 On the night of 30th/31st August 1943, Sergeant Ashton was detailed to attack Munchen Gladbach as engineer of a Halifax aircraft. Shortly after leaving the target, the aircraft in which he was flying was attacked by a night fighter and the length of the fuselage raked by cannon and machine gun fire. Almost immediately, the rear and mid-upper gunners reported flames sweeping back along the fuselage. Sergeant Ashton then noticed that the batteries had caught fire and saw smoke and sparks rising in the rest position. Without hesitation, he lifted a fire extinguisher and played it on the flames surrounding the batteries. Eventually the flames began to subside and Sergeant Ashton left this fire extinguisher at this position and obtained another. He then proceeded to the mid-position where he lifted the bomb-bay door inspection panels. On doing so, the flames blew up in his face. Disregarding personal danger, with his gloved hands he held and rotated the fire extinguisher in the opening in the floor so the fluid, with the assistance of the slip stream, was thrown about the bomb bays and eventually extinguished the fire. This action took place at an altitude of 18,000 feet and Sergeant Ashton was without the use of oxygen for the entire period. His courage, devotion to duty and disregard of personal danger were undoubtedly responsible for the safe return of the aircraft. In view of the above, I strongly recommend him for the immediate award of the Distinguished Flying Medal.